"What is communism?" I, around the age of eight, asked my dad. He gave me a detailed answer that left me baffled. Not because he couldn't adequately explain the topic, and not because he imbued his answer with an improper amount of laudation or condemnation for the communist system (My father, now over 90, has always been a man of the left --- so much so that I once asked one of my older brothers whether dad was ever a member of the Communist party*.) It was simply because so many of the concepts political systems are built upon --- the state, political classes, personal and group rights (or lack thereof) --- are beyond the understanding of someone whose years on earth can still be measured in a single digit. But my question wasn't really about the details of communism. It was about trying to understand how two abstractions --- communism and capitalism --- had led to the possibility of the extinction of the human race. It was the dawn of the 1980s and I was slowly becoming aware about the particular condition of the world I lived in: the Soviet empire had thousands of nuclear missiles aimed at targets within the United States and the United States was doing the same to targets in Russia. I was realizing that the possibility of an all-out nuclear holocaust, one immolating not just millions of people but whole cultures and societies, was quite real. How does an eight-year-old deal with that? I wish I could tell you, but I seem to have lost all recollection of my emotional response. Was the fear so overwhelming that I've blotted it from memory? Or did I have a seemingly naïve hope that it would all turn out all right? I don't recall having nightmares on the topic, but I do recall being permeated with the general sense of discomfort. For a few years there it seemed like no moment could be fully enjoyed; there was always this possibility of a missile coming over the horizon and ruining everything. And, growing up in Hawaii, as I did, there was a stark monthly reminder that brought the topic to the front of consciousness. Hawaii, having been famously attacked by the Japanese in 1941*, had instituted an island wide warning system. It was tested every 30 days or so when a clamorous, undulating moan would fill the air for several minutes. It was, of course, only a test, but it reminded you that the possibility of your life changing, or perhaps ending, in an instant was real. * The elementary school I attended, Lunalilo, had been accidentally bombed by the Japanese in the attack that set off US involvement in World War II. Fortunately, the attack had occurred when school was not in session. And children fear death differently than adults. Part of growing up is learning to accept uncertainty, or least manage your fears of it. Children lack the emotional tools to do so. As you grow in years you develop some sense that were it all to end tomorrow, at least you had some experiences and were given a chance to live. Children operate under the largely correct notion that their childhood is preparing them for real life. If they died tomorrow, they would never have really lived. And it's the denial of that promise that must seem especially grating. I do recall that this sense of potential nuclear holocaust was amplified by much of popular culture during the 80s. One of the more talked about movies of among my peers was "The Road Warrior" which reinvented the cowboy genre by casting it against the backdrop of post-apocalyptic Australia. Another movie, something of a cult favorite of mine, "Night of the Comet," followed the adventures of several teens after a comet flies over the earth, killing the vast majority of the populace. The comet as an allegory for nuclear war was obvious enough that even young teens such as myself could get it. And comic books got into the game as well. Jonah Hex, a DC Comics Western gunfighter character of declining popularity was re-molded as a Mad Max adventurer who was transported to an alternate future after a nuclear war. And, as I grew into my later teens, "The Watchmen" comic book serial was released and contemplated the idea that the nuclear arms race had pushed the human species into the 11th hour of its existence and that only drastic measures could prevent Armageddon. Preteens and teens are avid consumers of popular culture, and to see a message --- in this case, that the end was nigh --- repeated as often as it was in our entertainment was both disconcerting and exciting. On one hand, the way these narratives so blithely presumed the mass extinction of humanity --- as if considering any other option was naïve --- was rather soul rattling. On the other hand, I can't deny some sense of glamour of the era. Living in the end times seem to bestow a grandiosity on one's existence. The big kahuna of entertainment products dealing with nuclear war was a serious minded television movie produced by the ABC network called "The Day After." The film premiered when I was in the sixth grade and students were sent home with notices from our school informing our parents that they might want to monitor our viewing of the film due to its disturbing content. I did watch the film with my mother and still recall the effect. It wasn't in any way visceral -- there were no irradiated half human zombies roving a landscape permeated with luminescent green gas --- it was simply a very grim movie. 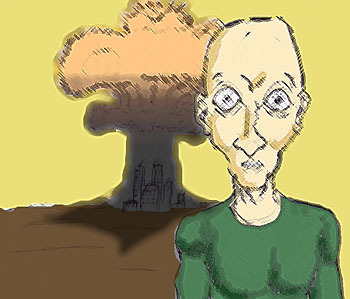 The film followed the lives of various characters who survive the aftermath of a nuclear attack prompted by escalating tensions between the United States and Russia. (The country that commits the first strike is never revealed.) Most of the characters, good or bad, eventually succumb to radiation poisoning or expire in some manner. And this kind of cynicism --- the argument that strength of character could not save you, or even grant you a death filled with some kind of meaning --- had been largely absent from television. As a movie, "The Day After" was shaking its head at the meaninglessness of it all, and that was far more frightening than any amount of blood or gore. That said, I went through my teen years (generally aligned with the decade of the 80s) largely optimistic about the future. At least, my concerns were not focused on the possibility of nuclear devastation. In hindsight I'm rather curious how this was possible. Were I and my peers and the majority of American society willfully blind to the obvious? Should we have been down on our knees praying every day for some kind of salvation from the possibility of fire raining from the sky? I think there was a method to our madness. There was a suspicion that, whatever horrors the human race has brought upon itself, any one individual would find it difficult, maybe impossible, to turn the key that would release a nuclear payload onto the world. I'm reminded of the scene that opens the film "Wargames" in which a military officer, thinking he is observing a potential real attack of Russian missiles, finds himself unable to retaliate. Cynics no doubt find my faith in humanity naïve --- certainly the producers of "The Day After" and "Wargames" and the plethora of anti-nuke films made in the 80s would --- but I would argue history bears me out. The funny thing is how it ended. In November of 1989, several months after I had graduated from high school, the Berlin Wall fell and West and East Germany were reunited. Newspapers and television broadcast the event as a seminal moment of the 20th century. I was confused, much as I was after asking my dad about communism. How would these events, far away in Europe, affect my life, or affect America? How could something occurring in Germany affect the entirely different country that was Russia? It was the disconnectedness of it all that baffled me. I find myself wondering what it's like to be a child in the world of today. With 9/11 and ensuing terrorist attacks in Europe and elsewhere, children have seen a realization of their fears in a way that my generation ever did. While the potential devastation of a nuclear exchange was far greater than a terrorist attack -- it could have been, quite literally, the end of the world -- there was something dreamlike about the whole scenario. When it came down to it, it was hard to believe that someone could actually turn the key. With terrorism, we've seen them turn the key, and can confidently predict more will be turned. And we all wrestle with that nagging suspicion that eventually technology and nihilistic dedication will combine into someone walking into New York City with the bomb on their back. How do today's kids and teens deal with that? Of course, I'm considering the largely unrealized fears of children of the Western world -- children who will likely never face the consummation of their nightmares. There are and always have been children in places drenched in actual violence, hunger and uncertainty. And wide-eyed commentators always note that despite the fact that these kids grow up in dire circumstances, they maintain their ability to be children, to make dolls out of the detritus of bombed out schools and such. We marvel at this, but seldom come up for an explanation as to why this is possible. But I'll give it a shot. As mentioned above, kids know that they aren't quite living yet, they aren't fully responsible for their own lives. They have a certain faith that things will work out because they have to. And it's the loss of that faith that's perhaps the most disturbing part of becoming an adult.